Corner House is rather special. Nested in the middle of the Botanic Gardens, the two-storey restaurant is understatedly elegant in a cosy setting, with an effortlessly intimate ambience. We were led upstairs through a small dining room to the glazed veranda, seated among the lush tree tops in a glowing cocoon. Notwithstanding the Botanics Gardens has recently been made Singapore’s first UNESCO World heritage site, I believe it was totally apt and justifiable when he described the venue as “badass”. Chef Jason Tan serves Gastro-Botanica cuisine; he takes French classic culinary grounding, injects inspirations that transpired from his travels and focuses on the elaboration of edible plants - lots of pretty words. The menu offered a choice of 4 or 6 courses, as well as an 8-course tasting menu. 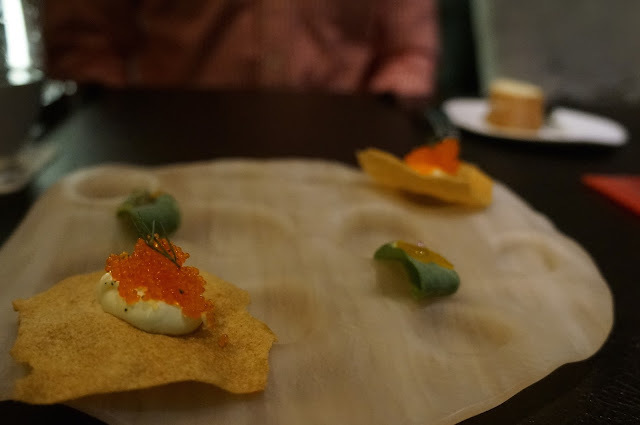 We started with a couple of snacks: toasted buckwheat crackers with a dollop of cream cheese & tobiko and oyster leaf with a droplet of yuzu. Again the portion for seafood dishes is comparatively generous. The thick discs of jumbo scallops lusciously creamy, subtly seasoned by a thin glaze of savoury miso without puncturing the oceanic sweetness of the fleshy morsel, heightened by the popping of the juicy marinated roe. The balanced combination of burnt orange and yuzu gave an unfamiliar twist to the citrus fragrance, which complimented the scallop beautifully. I’m loving the presentation – very Heston. It was a little odd to find two oyster-shaped porcelain dish instead of shucked oyster shells… and the dry ice was making funny noises as the steam dries out. As an avid oyster lover, I have had some pretty epic oyster dishes. This may be one of my favourites. The seemingly clear granité was refreshingly flavoured with something sweet. It says plum on the menu, but I thought it was more like blue ginger, perhaps I was distracted by the herby basil seeds. Regardless the cold breath of earthy fragrance worked well with the creamy oyster sacs hidden beneath the smile pile of shaved ice. And yes there were at least 2 oysters per ‘shell’. Great start. So this is how fish would look if they had goose-bumps... Chef has taken crispy skin to a new level. 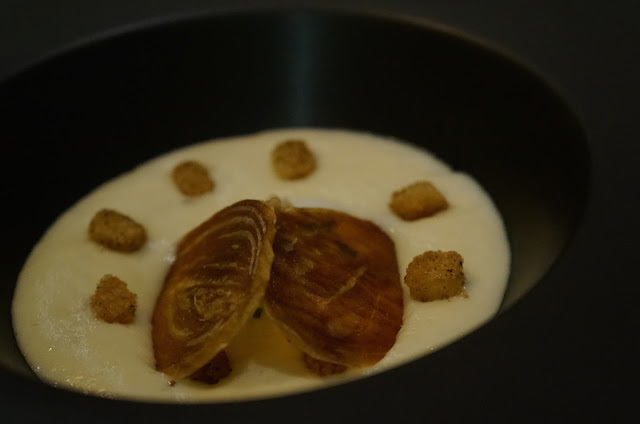 The dainty cod fillet was slithery and succulent, contrasted by the delicately fragile skin and the toasted, brittle scales, creating a stimulating mouthfeel. What we couldn’t get our heads around, was the beetroot. On its own it was fine; sweet with a soft crunch, but its abundance was overpowering the gentle fish and shaoxing aroma. In my humble opinion, I’d suggest celeriac or turnip paired with nettle, or asparagus. The sweet onion veloute was thick but airy, each spoonful was concentrated French onion soup in velvet with faint traces of nutty scent. Underneath the two sheets of onion crisp lies the onsen egg. I broke into the custardy yolk, which further enriched the structure of the savoury soup, while the wobbly whites added to another silky texture. It was delicious. So far our two courses have silently arrived at our table. The staff appears to be well-trained and we have felt quite well looked after so far, yet the lack of introduction to our dishes was somewhat tainting the experience. Luckily when we asked, our server was eloquent in the introductions. This was insane. 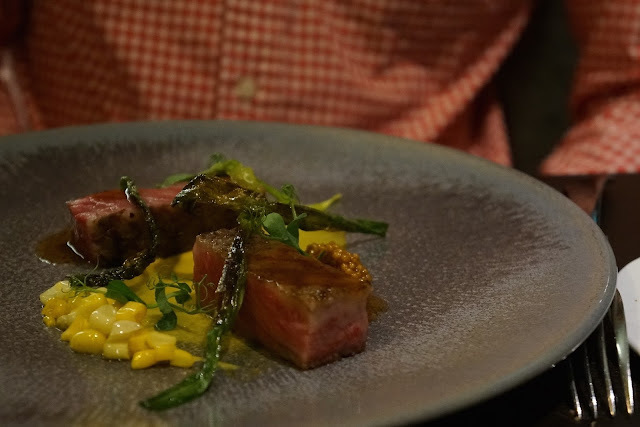 The marbling on the Wagyu beef was oozing buttery bovine richness; the meat was soft on tongue, and each bite was a mini explosion of the melted beef juice in mouth. It was immensely satisfying. We have been spoilt with some extraordinary meat and this is undoubtedly up there with the top-notch beef we have had. The sugary sweet corn accompaniment was quite unusual, but the sweetness did well to break up the beefy grease. By contrast the pork collar is looking undeniably less enticing. Despite the presentation, or the lack of, the strips of pork was excellent. Laced with springy collagen and translucent lard, the tenderised muscles were marshmallow-soft with a slight bounce, bursting with piggy flavours as the grease melts from chewing. (It was no Wagyu beef though.) I didn’t note any hints of foie gras, but the meat itself was already quite heavy so I didn’t miss it, not to mention the foie gras overload from Les Amis the day before. The deconstruction of Kaya toast, served with a generous portion of air, was an ensemble of delicious sweet treats. My favourite was the crème caramel sandwiched in two crumbly biscuits, though there was nothing ‘kaya’ about it. It is unusual for the both of us to choose the same dessert, however it’s fair to say this was the most interesting option. Unless you’re a durian lover, in which case the durian BB pudding could be a winner. Not for me though, thank you. We thoroughly enjoyed Corner House. The food was exceptional; flavours were balanced, execution was precise and recipes had a good dose of creativity. Service was generally good, they semi-passed the napkin test and fussed over us without being intrusive. It was also nice to meet Chef as he saw us off at the end of the evening.